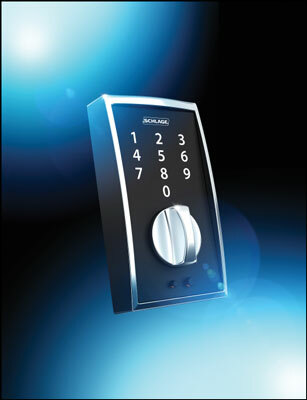 Schlage has introduced the Connect and Touch lines of keyless locks, which also offer you connectivity with many of the major home automation companies so that you can control your electronic locks remotely. It has been awarded the highest security grade in the industry, a Grade 1 rating. It features a motorized deadbolt. You can create and delete up to 30 access codes at a time. It uses Z-Wave technology to connect with home automation systems from third parties. You can remotely control your lock using your home automation system’s app. It comes with a built-in alarm that sounds when the lock is tampered with. Activity Alerts let you know when folks come in or go out. It can tell when someone is using a lot of force to open the door, and then instantly send you a notification on your smart device. 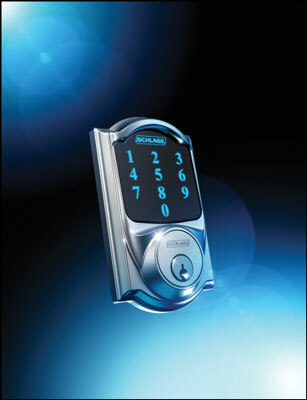 It enables you to go totally keyless or use a key, whichever you prefer. Credit: Image courtesy of Allegion plc. It sports a Grade 2 security rating, which is high — but it ain’t a 1. When Schlage says this lock is keyless, it means it; there is no key with the Touch line of locks. You use the keypad, an app, or you stay locked out. According to Schlage, this line is 100 percent pick-proof. It remembers up to 19 codes at a time. A built-in light helps you see what numbers you’re pressing on the keypad. If your home automation system provider is not listed, check its website to see if it’s compatible with the Schlage line of electronic locks before purchasing a Schlage lock.